Everything you need for design, development and provision of websites and applications. 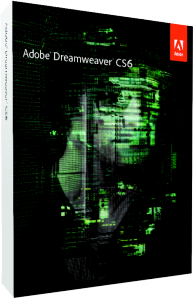 With Adobe Dreamweaver CS6 you can create innovative web designs and apps with a clean and solid HTML5 and CSS3 code. Fluid Grid layouts support you on your designs for tablets, mobile devices and desktop systems. Having CSS3, jQuery Mobile and Adobe PhoneGap Build on your site makes the development of your projects a lot easier while still meeting the current standards. You can check your designs with a real time and multi screen preview. CSS3 transitions and modern web typography make your results even greater. With the new FTP features you can easily transfer large files and save some precious time. Create inspiring web designs and complex layouts that adapt to the different screen resolution on desktop systems and mobile devices effortlessly. Use the implemented panel “Business Catalyst” in Adobe Dreamweaver CS6 to connect and work on websites that you create with Business Catalyst (also available with Adobe CS real time services). You will be able to run highly professional E-Commerce sites. With jQuery Mobile, its help tools for coding and integrated templates you can easily join the world of mobile devices. New Adobe frameworks help you create apps for mobile OS such as Android and iOS. With PhoneGap Build you can convert HTML codes into applications without even leaving Dreamweaver. The integrated emulator lets you run real time checks on the app while still working on it. Using transitions on your projects make them livelier and special. Take benefit of the high control you have over your web design while implementing some impressive effects. Check your web sites before releasing them with the WebKit Rendering Engine that meets the highest standards on providing HTML5 content on browsers and mobile devices. Make sure your layouts are consistent and compatible on all devices. The Multi Screen Preview control panel makes the development of designs for mobile devices, tablets and desktop systems easier. With media queries you can comfortably control the content you want to screen on different devices. *Adobe Business Catalyst separately available.